From the start, Great Lakes Commons has been seeding a transformative approach to current water governance. Using the histories and frameworks from both 'commons' and 'Indigenous' sources, we continue to map how these principles and practices enrich our connection and protection with these waters. But there's always also been a critical tension between these sources. Craig Fortier's new book Unsettling the Commons: social movements within, against, and beyond settler colonialism helps us name and integrate this tension. This post aims to introduce some of Fortier's main ideas and examples, while reflecting on GLC's mission, projects, and partnerships. The book draws on 51 interviews Fortier had with political organizers who work to replace hetero-patriarchal, capitalist, and colonial systems rather than to just reform them. One of the clearest examples Fortier uses to disrupt the progressive politics of 'the commons' is by looking at several movements that are 'reclaiming the commons'. These would include: environmentalist back-to-the-land movements, Burning Man festival, community gardens, kibbutzes, and alternative currency movements (21). The book is specifically focused on how these movements on Turtle Island (North America) erase relationships with Indigenous histories and futures. 'Commons' activism aims to renegotiate social relationships that are radically more democratic and egalitarian (21). But reclaiming and redistributing land and wealth in Canada and the USA (places with stolen land and people) opens up critical holes in the progressive banner of change. Fortier uses the Occupy Movement as an example. Starting in 2011, activists 'reclaimed' city centers to demonstrate the glaring and corrupt wealth inequality in the U.S.A.. In New York city's financial district, private land (Zuccotti Park) was renamed and reclaimed as a commons (Liberty Plaza). The change honored the Park's name in the 1930's, yet sidestepped the context of the 'Liberty' naming itself. Before it was known as Manhattan, this land was called Manna-hata by the Lenape nation. Once forcibly occupied by Europeans, these settlers renamed the lands to protect and project their own destiny. No liberty was being celebrated for the Lenape in this park. After colonial critiques of these Occupy camps, ones such as Occupy Oakland considered changing their name to Decolonize Oakland instead. But this movement's focus on capitalism over colonization, caused a split in group. In this 'reclaim the commons' example, radical political intentions about the wealth of the 1% and the resistance by the 99% erase ongoing events of settler colonialism. According to Clare Baynard (a white anti-racist educator with the Catalyst Project), settler's inability to imagine a future outside of the eurocentric settler-logic is a major barrier for change (32). For many, the 'collective' aspects of the commons garner all the attention, rather than their exclusive elements (34). Evading practices include the languages of 'reclaiming' and 'occupy' already mentioned. Fortier also looks at anti-gentrification activism to illustrate this practice. How can we link the spread of consumer-communities into poorer neighbourhoods with the ongoing conversion of Indigenous communal homelands into settler private property? Fortier's reflections on the No One Is Illegal movement adds another layer on this erasure because fighting for state status and migrant justice can bypass colonization on the way to granting citizenship. I can use Canada's 'national' anthem as an example and tool of erasure. I put 'national' in apostrophes because a settler-state such as Canada cannot be a single nation. The borders of Canada and the USA enclose many Indigenous nations, while settlers celebrate a multi-national diversity based on settler inclusion rather than Indigenous exclusion. At schools and sporting evens Canadians sing our National Anthem, "our home and native land" instead of the hacked version of "our home on native land". This evading leads easily to naturalization. GLC has connected with many water groups over the years who are 'taking back' the water, often labelled as 'our' water that should to be protected by 'our' democratic and 'public' institutions. To protect water from private corporations, these claims about water often validate the same values and governments that extinguish and erode Indigenous authority and relationship to water. When it comes to water quantity, the Great Lakes Compact denies Indigenous authority. What can be said about campaigns advocating for Public control of water systems and the Public Trust Doctrine? Within the current governance system, these narratives and tools disrupt the financialization and privatization of water and help keep water clean, affordable, and accessible. Naturalization practices are also captured by Nationalist myths where peak social justice is about inclusion of Indigenous peoples into Canadian and USA society, rather than fostering multiple sovereignties. Insistence of 'public' resources for 'the people' also reinforces settler-state power. So while Occupy and other progressive movements fixate on wrestling the state from elite powers (the 1%), the default political code is that these rights and resources naturally belong 'to the people'. One of the complexities of a commons is figuring out who has authentic authority. While equality would mean dividing the USA's assets between the 99%, equitable distribution would have to first ask: "How did Americans come to claim the land known as the USA, who was this land taken from, and who should lead the calls for redistribution?" 'This Land is Our Land', 'Who's Streets, Our Streets', and many other commons-like political tags normalize settler political desires while reconstructing Indigenous desires at foreign (41). This is settler-logic in action. Fortier presents the work of Ruben Gaztambide-Fernandez who reminds us that "individual subjects do not enter into relationships, but rather subjects are made in and through relationships" (47). It's this 'double bind' that we struggle with when working against and beyond systems of injustice, while also being within them. For me, the stress with these relationships is to critically examine how our national, consumer, citizen, neighbor, and even activist identities are constructed through ongoing political forces. What languages hold in our work? Do we use American or Canadian english spelling? What kind of national currency do we use and what value is this money based in? Do we honour political boundaries more than ecological ones? Do we consider how our actions impact non-human life and the lives of future generations? What do we really know (when it comes to Indigenous identity and authority) about the lands and waters we call home? These are just some the relationships that shape us and maintain (or possibly resist) colonization. Appropriating practices are also common between progressive movements and Indigenous ways of knowing and being. Environmental ethics, participatory democracy, gender equity, and inter-national mutualism are the core of left-ist ideals. Because western culture has lost its cultural roots, it absorbs foreign practices and then claims them as its own. How many examples do we have of white men 'discovering' something or someone that already exists? Even if the practice of sharing and sustaining a commons was rooted in indigenous European life, what parts can and cannot be transplanted? GLC's Charter Declaration starts with "We, the People of the Great Lakes" which mimics parts of the U.S. Constitution. This Charter was a collaborative effort between native and non-native water protectors and the language (while created and shared only in English for many years) reflects Indigenous and commons ethics and desires. While the Charter is now in 5 Great Lakes languages, how might it appropriate Indigenous teachings or even evade or naturalize them? Or does it honor these teachings, value the spirit of collaboration, and start to unsettle Great Lakes governance? Let us know in the comments section. Fortier and several other activist in the book want us to focus on the types of respectful relationship-building that is needed when adapting Indigenous nation-making into their struggles. Fortier offers 3 ways we can re-imagine 'the commons': as a practice, a place, and as a relationship. When speaking to Essex Lordes and Li Morales (organizers within queer POC struggles in the Bay area) the tendency to homogenize practices of commoning should be questioned. Instead, practices that are both caring and destabilizing give us a way forward (60). Unsettling water governance, for example, insists on the contingency of the settler state and its powers and projections into the future. Compared to the unity of coalition politics, this destabilization aligns with Eva Tuck and K. Wayne Wang's call for 'uncommonality' (61). In order to decolonize, the political paths of Indigenous and non-Indigenous peoples can diverge. Comparing the practices of allies versus accomplices, Fortier and others highlight the need for settlers to 'unmake' those relationships that maintain colonial power. Using the example of the Tar Sands Healing Walks, Fortier shows us an Indigenous/Settler fight against fossil fuels that is led by Indigenous women and reconnects everyone to land and water through ceremony. This walk was not a protest. This was not a reclaiming of the commons. This was not asking for settler permission or recognition. Being an accomplice in decolonization should expose the normalized, violent, and ongoing erasure of Indigenous futures. The settler's positionality within this crime should be a practice of both refusal and realignment. Looking beyond the book, the Great Lakes have Sacred Water Walks led by women, Great Lakes gatherings, and decolonial water projects that are continental and local. There are Treaty Workshops and decolonial maps being made. There are decolonial legal challenges and legal knowledges centering Indigenous power and there are toxic walking tours close to Indigenous reserves/reservations. The list goes on but the point is the same. When it comes to water protection and authority, what practices unsettle the colonial processes? So the practices of commoning need to destabilize settler relationships, but what about how commoning relates to place? 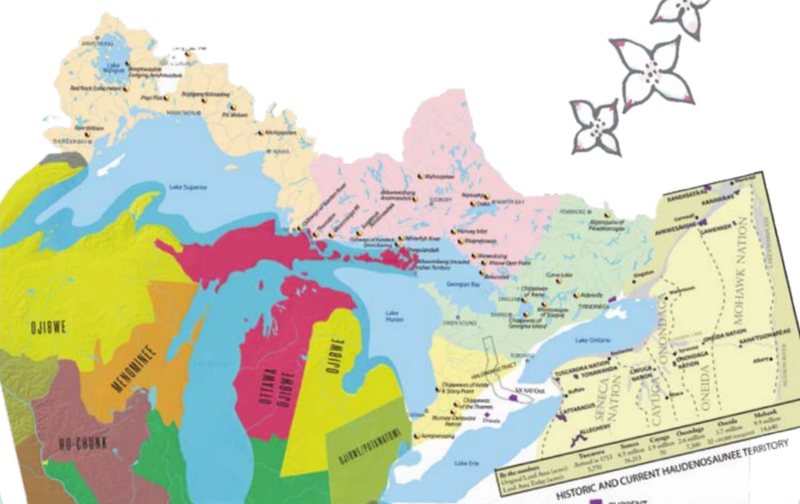 A map collage of Indigenous nations and the Great Lakes. From GLC's Indigenous Water Governance toolkit resource. Much of GLC's work is reframing water governance from 'resource management' to 'life source reciprocity' -- to put it most simply. The commons framework creates opportunities beyond public or private ownership and celebrates the unifying thread between past, present and future generations. Over the years GLC has shifted from a more secular understanding (perhaps a European bias) of the commons to a commons that is both shared and sacred. We are not 'reclaiming a commons' but making one within the context of 'the' waters -- not 'our' water. We support, design, and collaborate on projects that enter grateful and reciprocal kinship with water, rather than the stewardship, management, and conservation of water (that stress only human agency). We seek and value learning 'from' water, rather than just 'about' water. Like all water groups (mostly) lead by non-Indigenous people, we need to be accountable to the Treaties and our positions here on Turtle island. We welcome ideas on how to do a better job. Fortier's analysis uses a 'within', 'against', and 'beyond' settler-colonialism framing to include multiple layers of political theory and action. Commoning in a particular place (such as the Great Lakes) has taught GLC a lot about 'uncommonality' even as we try and build unity and seed disruption into colonial Great Lakes governance. In 2017 we created a Charter Toolkit to animate parts of our Commons Charter. Resources within, against, and beyond the current set of relationships were made to unpack how place matters when building a commons (rather than re-claiming one). These are 3 of 10 questions from a resource about bottled water that try to bring theory and action together (ie, campaigns to reduce and stop the commercialization of water). The GLC Charter includes a set of First Principles that honor the ongoing relationships and agreements communities (primarily Indigenous communities) have with the Great Lakes. Along with commoning with a critical understanding of practice and place, Fortier explains why relationships are central in the struggle. Because settler-colonialism is more of an ongoing current relationship rather than historical events it's important to name the default and desired relationships in the water work (21). Sarita Ahooja centers care, consent, accountability and reciprocity in her migration work with No One Is Illegal (77). Looking further into just one of these (accountability), how can settlers begin to acknowledge the Indigenous homelands they are in and commit to becoming an honest Treaty partner? Can water NGOs protect water not just through better government rules, but help re-align the authority behind the rules too? Tribes and First Nations in the Great Lakes have clear principles and authority for water projection. How well do settler's know about and help enforce these principles as an act of accountability? Inspired by Leanne Betasamosake Simpson's description of 'decolonial constellations of resistance' Luam Kidane unpacks accountability further with a self-awareness of "where you are from, what your position in the structures of power in our society is, and what your relationships are to the people and groups you want to work with" (97). Fortier and others use anti-black racism and the Black Lives Matter movement to highlight these various positions and the truth of stolen peoples and stolen lands for Turtle Island liberation. Informed by his own anti-authoritarian activism and analysis and his interviews with a diversity of other activists, Fortier's book helps us to not 'reclaim the commons' but to 're-imagine' how a commons movements understands key practices, place-making, and relationships to unsettle colonial power. Does this re-imagining include shifting western expressions of what 'sovereignty' is and the web of political borders within watersheds ? Does it include just human relations and Treaties in the present or also our responsibilities with the non-human world and all our relations across time? Does a Great Lakes Commons embrace decolonial love? Perhaps the tragedy and magic that happens between our waterbodies can teach us what water governance is more fully about. Can water governance be scaled from the global water cycle to the individual life cycle? Our love for water can embrace the oceans between and within us as we unsettle Great Lakes rules and authority. Surrendering to the practices of decolonial love can save us from the violence of hetro-patriachy, capitalism, and colonialism when both valued and embodied. In this radical pedagogy of decolonial love Fortier highlights the Oshkimaadziig Unity Camp and Karen Recollet's work to "bridge the mental, material, emotional, and spiritual through the practice of relationality an reciprocity (107). During the Tkaronto (Toronto) book launch, Fortier said he wanted to support ongoing conversations on how progressive social movements (and/or anti-authoritarian ones) can unsettle their political positions. Great Lakes Commons welcomes this moment. Older PostCollaborative Governance: who rules the waters?